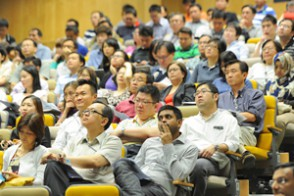 Improving the user experience, enhancing productivity and ensuring the sustainability of ICT – these were some of the key points addressed at the 39th Public Sector Infocomm (PSI) Seminar in January. The PSI Seminar is held twice a year to provide public officers with the latest information on public sector infocomm developments. One of the topics covered at this year’s first seminar was the Workplace of the Future. Conceptualised in 2011, the Workplace of the Future is aimed at addressing various challenges such as attracting and retaining talent, managing new ways of work and engaging different segments of the workforce. In his presentation, Mr Ramkumar Krishnamoorthy, Consultant, Government Infrastructure and Technology Division, IDA, provided updates on some of the key services under this initiative, such as GoMax and GoSync. GoMax is a managed mobility service introduced in 2012 to provide public officers with access to core services such as email, contacts and calendar, via multiple mobile devices. There are currently more than 3,000 users for the service, which is available on the iOS platform. Support for the Android platform is expected to be in place by the first half of 2014. GoSync is a cloud storage service that allows public officers to share information. It is now undergoing a whole-of-government trial. New features include a web-based office, co-authoring and native synchronisation, which allows users to take documents offline and have them updated automatically when they are re-connected. Users on the existing desktop collaboration system will be migrated to GoSync by the end of this year, said Mr Ramkumar. In another presentation, Ms Emily Chuang, Cube Manager, PS21 Office, Public Service Division, spoke about creating an engaged and connected public service through Cube, a Public Service social intranet for officers to share knowledge, exchange ideas, give feedback and collaborate on projects. Cube aims to spur teamwork and communication among public officers across agency boundaries, to build a more networked Public Service community that shares the common objective of serving the nation. Another topic that was discussed at the seminar was sustainable ICT. With Singapore targeting to reduce carbon emissions by 7 to 11 per cent by 2020, ICT leaders have the responsibility to ensure sustainability in the use of IT, said Mr Chon Say Kiat, Senior Manager, Government Infocomm Governance Division, IDA. He went on to discuss two initiatives under the Whole-of-Government Sustainable ICT programme. The first of these is the Sustainable ICT Framework, which is a step-by-step guide to help agencies implement sustainable ICT. The framework includes green ICT maturity assessment tools, best practices and guidelines, and a scorecard template. The second initiative is the Data Centre Energy Health Check, which will be conducted on 12 public-sector data centres. Based on its findings, recommendations for sustainable ICT will be developed for the whole of government. The journey towards sustainable ICT will not be made in one giant leap but will involve many little steps, said Mr Chon. For example, when there are opportunities to refresh data centre technologies, agencies could look at what is possible to enhance energy efficiency. As ICT leaders, the responsibility is “to do what is right and what is within our control,” he said.